Back in the late 1980s and early 1990s, Germany was not a birding nation, at least not by international standards. In the good old tradition of Stresemann and Mayr we were an ornithological nation, gathering systematic data on bird numbers and distribution of our regular breeding and wintering birds. Regarding the treatment of rare birds or vagrants however, we had barely left the hand axe stage. There was no vetting process whatsoever. No avifaunistic commissions, no rare birds committees, no reviewers. If someone claimed a Slender-billed Curlew, people assumed they had seen a Slender-billed Curlew. If someone maintained that he had seen a Wallcreeper crawling up an oak trunk inside a forest, people assumed that Wallcreepers will occasionally enter forests. If someone saw a Southern Cassowary flying over the inner city of Leipzig, people assumed he was full of crap. This changed with the emergence of one Peter H. Barthel in the late 1980s. He initiated and finally established a German records committee by international standards, he introduced German birders to the concept of having to write a report that needed vetting and acceptance for the observation to enter the scientific data base, and he confirmed that birders who saw a Southern Cassowary flying over the inner city of Leipzig were full of crap. He emerged as the leading figure of the birder scene when aspects of field identification and rare birds were concerned, he was – and still is – the backbone of the German birding magazine “Limicola“, and he wrote and translated (from English) many, if not most of the German field guides to birds. And this latter aspect is where pink bird weekend enters the stage. Of course being in the spotlight of the birding public, and telling many, many people that they probably haven’t seen what they think they saw and thus denying them publication, fame and fortunes meant that he saw and sees no small amount of criticism and ridicule. 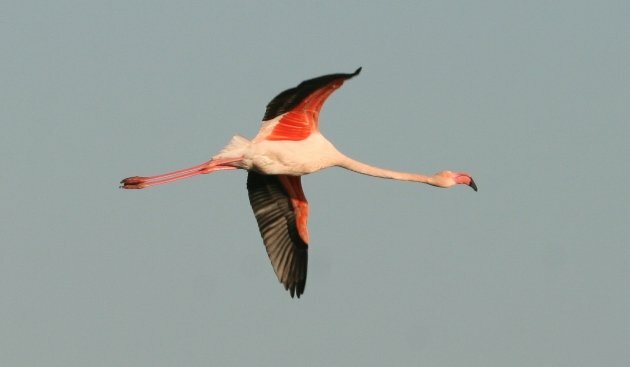 Stories of him having made a mistake were frequent entertainment amongst birders when the birds weren’t performing, and what follows is one of the most common urban legends I’ve heard about Mr. Barthel: In one of his field guides, he allegedly compared the flight appearance of the Greater Flamingo to a burning pencil. Say, what? 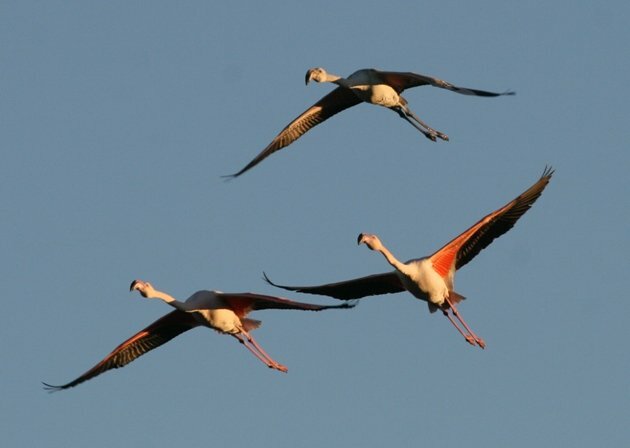 Yes, Greater Flamingos in flight are similar or reminiscent of burning pencils. Now, apart from the fact that most of us have only very rarely seen burning pencils, it is difficult to grasp what he meant by this comparison. While most birders were content with laughing about it and seeing it as a proof of Mr. Barthels alleged state of mind, I was always of a more curious nature. 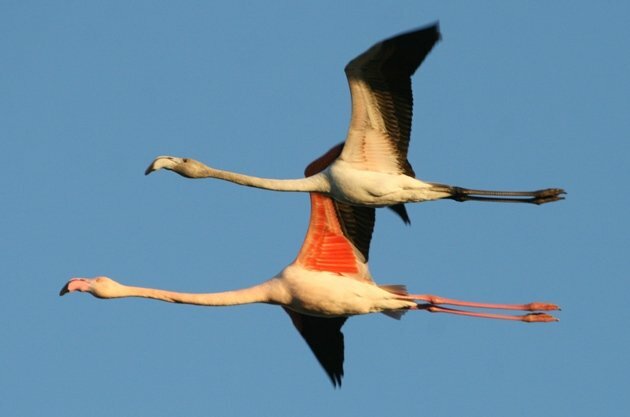 I really wanted to know, in an earnest way, just how Greater Flamingos resemble burning pencils in flight. 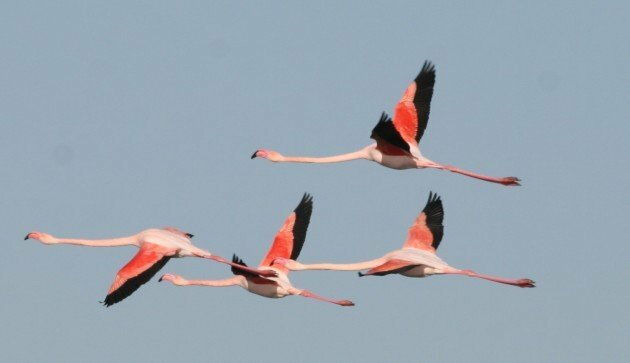 The comprehension – or rather revelation – came this January during a trip to southern France’s Camargue where Greater Flamingos can be considered a part of the landscape. Indeed, Mr. Barthel is the genius I always knew he was (no seriously, I like him and owe him lots), and Greater Flamingos do look like burning pencils in flight. To demonstrate this point, I have shied away from neither costs nor efforts and actually burned a pencil. Sadly, the pencil wouldn’t burn the way I wanted it to, and so I have employed no insignificant amount of computer-generated imaginary to your service and convenience. 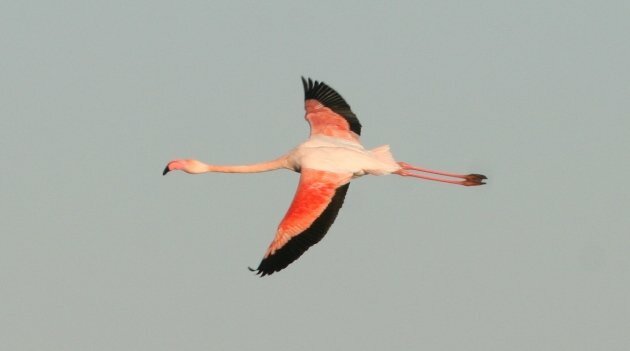 Below, you can see a picture of a Greater flamingo in flight, taken at France’s Camargue this January. This picture is followed by a burning pencil, and if I hadn’t told you which is which, you surely wouldn’t be able to tell. You can further check this striking similarity and the sharpness of the comparison by studying the next few images of Greater Flamingos in flight. Please note on the last picture that juvenile birds burn with a much colder flame than adults. “The flight of the burning pencils” is pure poetry, and I am thoroughly delighted that you have brought it to my attention. This whole post is in error. That is, unless you have a pink pencil.